Obama does have a long history of hanging with notoriously radical Jew-haters. (Top left clockwise) Barack and Michelle Obama with radical anti-Israel Professor Edward Said at a May 1998 Arab community event in Chicago at which Edward Said gave the keynote speech. 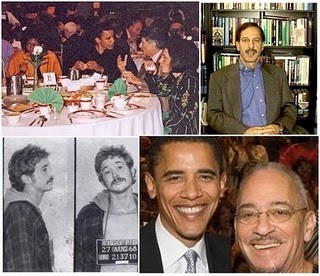 (Bill Baar’s West Side), Former PLO operative and close friend of the Obama’s Rashid Khalidi, Barack Obama and his racist Jew-hating minister Jeremiah Wright, and close terrorist friend William Ayers. Progressives Today has the transcript.